Library Advocate. : Read. Think. Grow. Richard Moore alerted California school teacher librarians of a new T-Shirt available through cafepress. Theme is "Read. Think. Grow." It comes in several colors and styles. Read. Think. Grow. goes well with my favorite poem: "The more you read, the more you know. The more you know, the smarter you grow. The smarter you grow, the stronger your voice, when speaking your mind or making your choice." 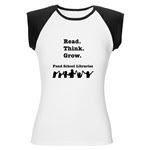 The t-shirt summarizes it to a "t."
a grass roots effort to support school librarians in Washington State. "Citizens across the state of Washington are calling on state leaders to ensure that all Washington elementary and secondary students have full-time access to school libraries and a certified teacher librarian". The website is a wealth of information. There is also a petition for WA state residence to sign.